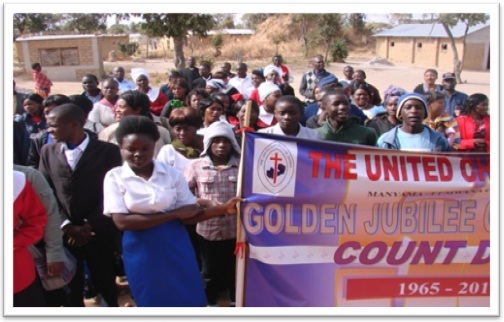 SOLWEZI: MANYAMA – LUMWANA Congregation was among other many Congregations in the Solwezi West Consistory that celebrated the Congregation Golden jubilee celebrations on 22nd June, 2014. Under the able leadership of the Rev. S.K. 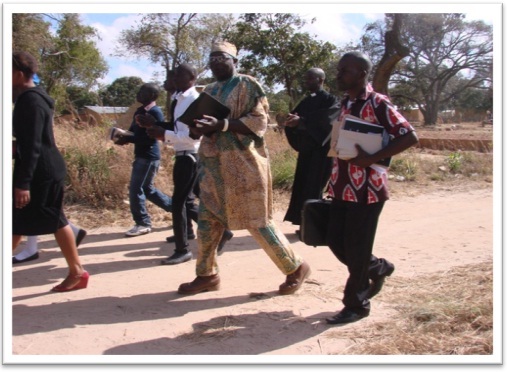 Chipendano, Manyama – Lumwana congregation celebration started with the match past around 09hrs from the Manyama Basic School Football Pitch along the Manyama Shops to the Church building. 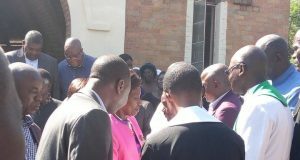 In attendance were the members of the congregation who matched while singing songs of Jubilee almost drawing the attention of everyone in the township. Also part of the matchers were choirs, WCF, MCF, the Rev Chipendano and elders. The Girls Brigade holding a beautiful Jubilee Banner and leading the group in the march past. More members coming to join the group in readiness for the march past. 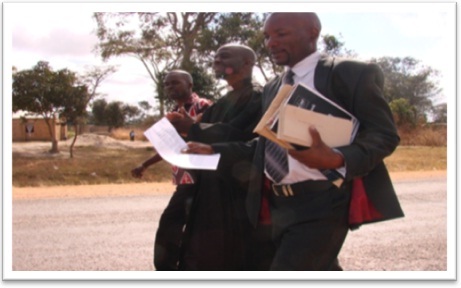 On the other picture Reverend Chipendano and Elder Chilufya in action leading by example. 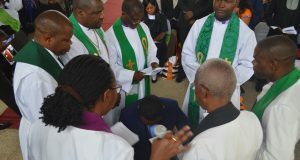 The Church Minister, Reverend S.K. 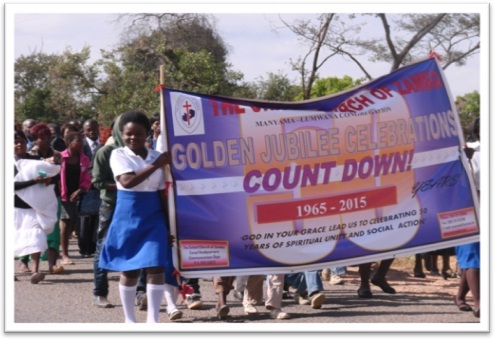 Chipendano and the Congregation Secretary Mr. Chimba Katuka joining the march past along the Road. Everyone singing joyfully, praising God for this day. 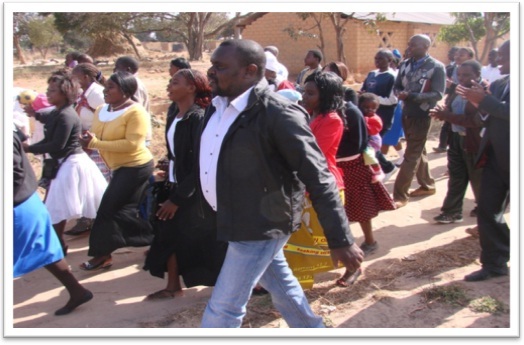 Marching to the New Church Building at Manyama. The music grew louder as the group approached the church building. Church members the young and the old are all praising God. Fountain of Praise Team singing Joyful songs and dancing for Jubilee celebrations. 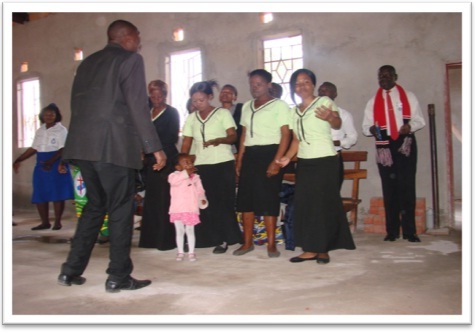 In the Church building, members are singing and praising the Lord. 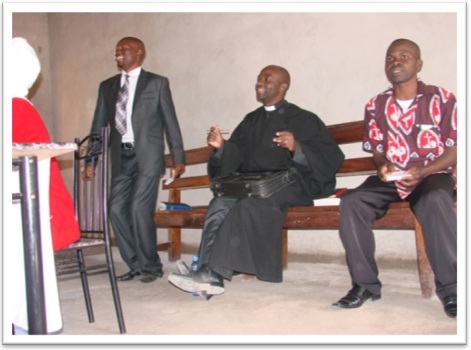 The Church Service started around 10: 00 hrs with joyful songs. 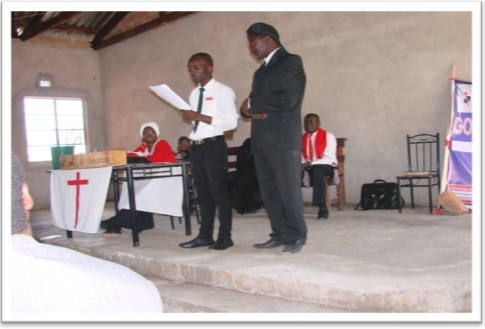 The church service was led by Elder Charity Mvula a WCF Convener while the minister the Rev. S.K. Chipendano delivered the homily. 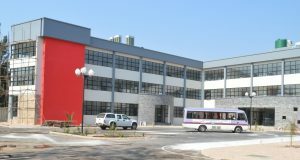 The Service ended around 13: 00 hrs with about 150 people in attendance. 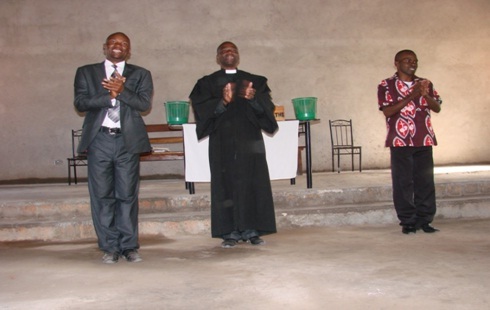 Mr Chimba Katuka (Left), Reverend Chipendano(middle) and Elder Chilufya David(Right) singing and giving praise to the Lord. 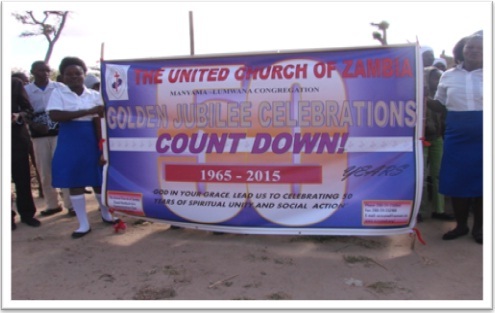 The Golden Jubilee launch was carried out successfully and the organization was awesome. Thanks go to all Church members for their commitment that made this celebration meaningful and fruitful. Glory to the Almighty God for His unfailing love and mercies who has allowed us to stand united for the past 50 years.